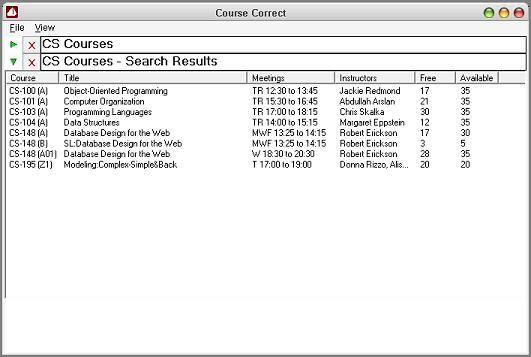 That's right, CourseCorrect has a completely new interface. 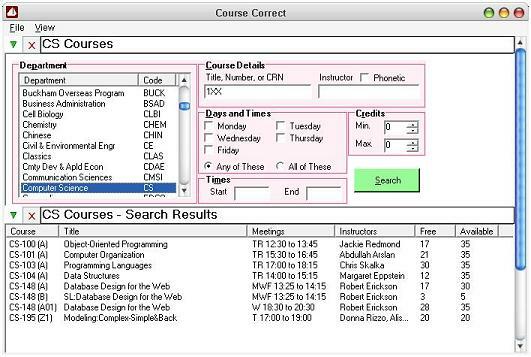 The old interface was great for the things it did (it was, after all, a project for Human-Computer Interaction) but didn't extend well to the new features I wanted to add. There wasn't any convenient place where the user could go to specify preferences, for example. The only thing that doesn't fit in as well is the big list of schedules to preview. I'm torn between having that as an optional vertical panel along the side (much like it was before) and just having it as another horizontal (collapsable) panel like all the rest. The big advantage here is that having multiple searches and multiple schedules is much easier: just add another "thing" to the screen!